Layne Thomas Staley (August 22, 1967 – April 5, 2002) was an American musician. He was the lead singer of the rock band Alice in Chains. He was born in the city of Kirkland, Washington. Layne Staley first played in a band called Sleze which consisted of Shorewood High School students as well as future members of the bands The Dehumanizers and Second Coming. The band morphed into Alice 'N Chains in 1986 and mostly played cover versions of Slayer and Armored Saint songs. Alice 'N Chains disbanded and Staley joined a funk band afterwards. The band needed a guitarist so Staley asked Jerry Cantrell to be a sideman for the band. Cantrell agreed but only if Staley joined his band. After the funk band disbanded, Staley joined Cantrell's band full-time and they renamed the band Alice in Chains. While he was with Alice in Chains, They released their debut album Facelift which featured the hit single, "Man in the Box" which was written by Staley. They then released an EP called SAP on February 4, 1992 and released their second studio album Dirt on September 29, 1992. The band didn't tour for Dirt very long because of Staley's drug addiction. Cantrell often wrote the lyrics for the band but Staley wrote more songs as time went on and was eventually credited with writing half of the band's catalog until their fourth studio album, Black Gives Way to Blue. When Staley wrote lyrics, they were often about dealing with his personal problems like drug use and depression. The other band members decided not to tour for their third studio EP "Jar of Flies" because of Staley's condition becoming progressively worse. Staley decided that he would enter a rehabilitation clinic after Jar of Flies and started a side project with Mike McCready of Pearl Jam and Barrett Martin of Screaming Trees called The Gacy Bunch. They later changed their name to Mad Season. During his time in Mad Season, they released 1 studio album, Above which featured the singles "River of Deceit" and "I Don't Know Anything". Staley's physical condition was changing during the hiatus of Alice in Chains and his addiction started to become more known to the public. Alice in Chains reunited to record the self-titled album Alice in Chains, also commonly referred to as Tripod and it was released on November 7, 1995. In October 1996, Staley's ex-fiancée, Demri Lara Parrott, died from complications caused by drug use. Her death made Staley even more depressed. He removed himself from the spotlight until he joined Alice in Chains at the Grammy Awards in 1997 after the song "Again" was nominated for "Best Hard Rock Performance". He recorded two songs for the Music Bank box set and producer Dave Jerden said that "Staley weighed 80 pounds…and was white as a ghost." Staley hardly left his condo from 1999 to 2002. On April 19, 2002, police kicked in Staley's apartment door to find Staley dead on his couch. His autopsy reported that a combination of heroin and cocaine known as a "speedball" that he had injected was a factor in his death. Staley was reported to be 6'1" and weigh only 86 pounds when his body was discovered, mainly because of his body decomposing due to him being discovered two weeks after his death. 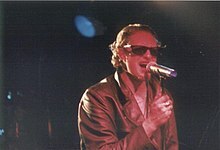 Wikimedia Commons has media related to Layne Staley. This page was last changed on 31 August 2017, at 06:11.